HTC's latest flagship smartphone HTC U Ultra is now available for sale in the Indian market which was launched in the country last month where its priced at INR 59990 which is around $900. The device up for sale on company's Indian online store. As we already know that the HTC U Ultra was launched with Blue, Black, Pink and White color options, its launched in India with only Blue and Black color options. The highlight of the HTC U Play and HTC U Ultra smartphones is its new Sense Companion feature that is an AI-based system that remembers users daily usage and provides suggestions and recommendations based on that usage. The HTC U Ultra will even display alerts and notifications on the Priority Screen which is the secondary screen available on this device. As we already know that the HTC U Ultra was launched with a 5.7-inch Quad-HD Super LCD 5 display having 1440 x 2560 pixels resolution and also comes with Gorilla Glass 5 protection and there is a 2.0-inch secondary display with 160 x 1040 pixels resolution, 520 PPI and Super LCD 5 features available to display alerts and notifcations. It is powered by a quad-core Qualcomm Snapdragon 821 64-bit processor (2×2.15 GHz Kryo and 2×1.6 GHz Kryo) that comes with Adreno 530 GPU. It has 4GB of RAM with 64GB/128GB internal storage options + MicroSD card expandable storage up to 2TB. It runs on the Android 7.0 Nougat OS out of the box with HTC Sense UI on top and also supports hybrid dual SIM. 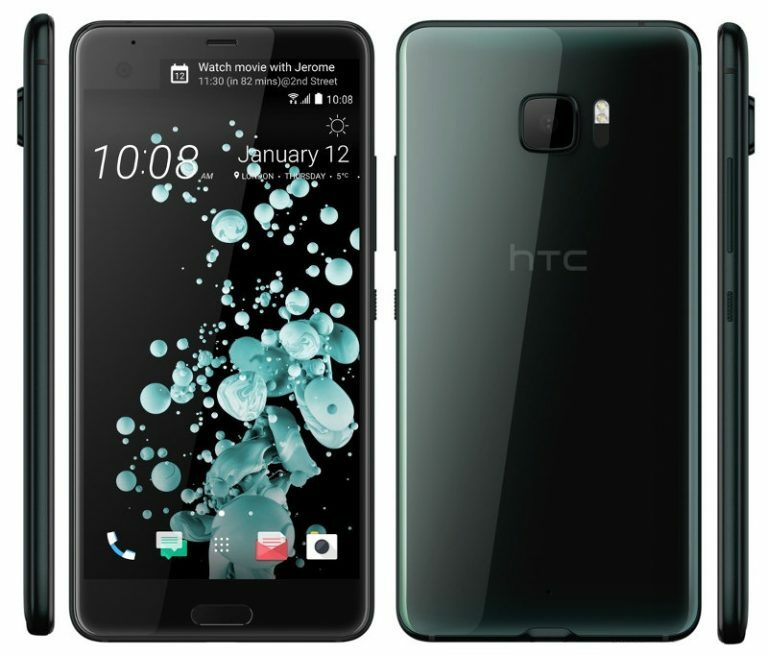 The HTC U Ultra features a 12-megapixel (UltraPixel 2) rear camera with dual-tone LED flash, 1.55um. pixels, f/1.8 aperture, Laser AF, OIS, 4K video recording and a 16-megapixel front-facing camera with f/2.0 aperture and UltraPixel mode.A 3000mAh battery with Quick Charge 3.0 feature backs up the device and connectivity options available are 4G LTE, WiFi 802.11 ac (2.4 and 5GHz), Bluetooth 4.2 and GPS with GLONASS, NFC, USB 3.1 Type-C. It also comes with HTC USonic, HTC BoomSound Hi-Fi edition and 3D audio recording with 4 microphones. It measures 162.41 x 79.79 x 3.6-7.99 mm and weights 161 grams.